Splints can be used for different injuries. Any time there is a broken bone, stabilizing the area is important. 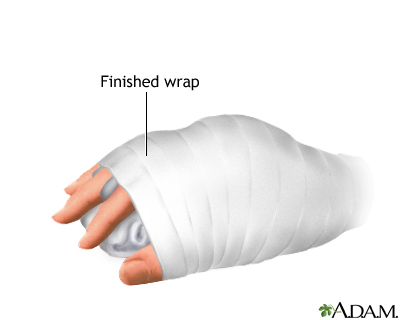 Extend the splint beyond the injured area in order to keep it from moving. Try to include the joint above and below the injury in the splint. Secure the splint with ties, such as belts, cloth strips, or neckties, or tape above and below the injury. Make sure the knots are not pressing on the injury. DO NOT make the ties too tight. Doing so can cut off the circulation. 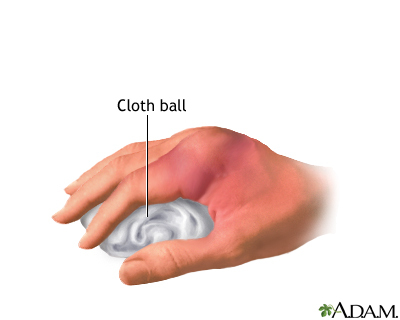 Check the area of the injured body part often for swelling , paleness , or numbness . If needed, loosen the splint. Chudnofsky CR. 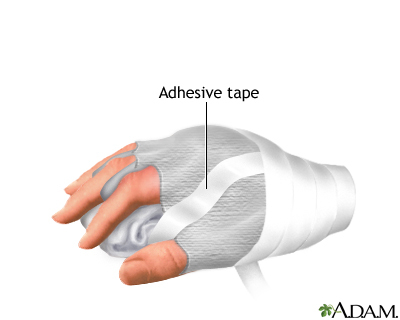 Splinting techniques. In: Roberts JR, ed. Clinical Procedures in Emergency Medicine . 6th ed. Philadelphia, PA: Elsevier Saunders; 2014:chap 50. Kassel MR, Gianotti A. Splints and slings. In: Auerbach PS, ed. Wilderness Medicine . 6th ed. Philadelphia, PA: Elsevier Mosby; 2012:chap 19.